Please support us in implementing our new 8:30 AM drop off and 3:15 PM pick up procedures. We have continued to reevaluate procedures due to safety. Pre-K, K, and siblings are dropped off and picked up at the north entrance (pre-k) by the soccer fields. Pre-K teachers and staff members will be at the entrance to greet students in the morning. Pre-K students will be supervised by staff and kindergarten students and siblings will walk down the east hallway and report directly to the East Room. Parents/guardians will circle back and exit on Roberts Road. There is no need for parents to exit the car. Staff will be there to help with drop off. The doors close at 8:40. Arrivals after 8:40 must use the east entrance. First grade-eighth grade students will be dropped off at the east entrance. The traffic pattern had been reversed. Drivers will turn right towards the garage and drive along the grassy knoll area at the east side of the parking lot and turn after the recess cones. Cars will pull up along the gated off area so children may safely exit the car. The first car will be stopped parallel to the horse/dumpster. There is no need for parents to get out of the car. Cars will proceed south out of the lot. Please don’t park near the entrance. This is only for a drop off. If parents need to enter the building they will park in the middle section of the lot and walk with their children into the building. Please don’t park in the designated recess area. Children must be accompanied by an adult when walking through the parking lot. Supervision ends at 8:43. Pre-K, K, and siblings are picked up at the north entrance (pre-k) by the soccer fields. Pre-K teachers and staff members will be there to send students home in the afternoon. All students will be supervised by staff. Parents/guardians will circle back and exit on Roberts Road. There is no need for parents to exit the car. Staff will be there to help with pickup and loading students into the car. The first car must pull up to the orange cone. Please have the name tag visible in the windshield or passenger window. Overflow cars will be lined up in the front parking parallel to Roberts Road. Arrivals after 3:25 will need to go to the east entrance and come in to pick up their child. First grade -eighth grade students will be picked up at the east entrance. The traffic pattern has been reversed. Drivers will turn right towards the garage and drive along the grassy knoll area at the east side of the parking lot and turn after the recess cones. Cars will pull up along the gated off area where supervised students will be waiting. The first car will be stopped parallel to the horse/dumpster. There is no need for parents to get out of the car. Arrivals after 3:25 will park and come into the building to pick up students. If parents need to enter the building they will need to park in the middle section of the parking lot and walk into the east entrance to be buzzed inside. During inclement weather parents will park in the east lot and enter the building and meet children in the East Room. This only applies to children that are picked up in the east lot. 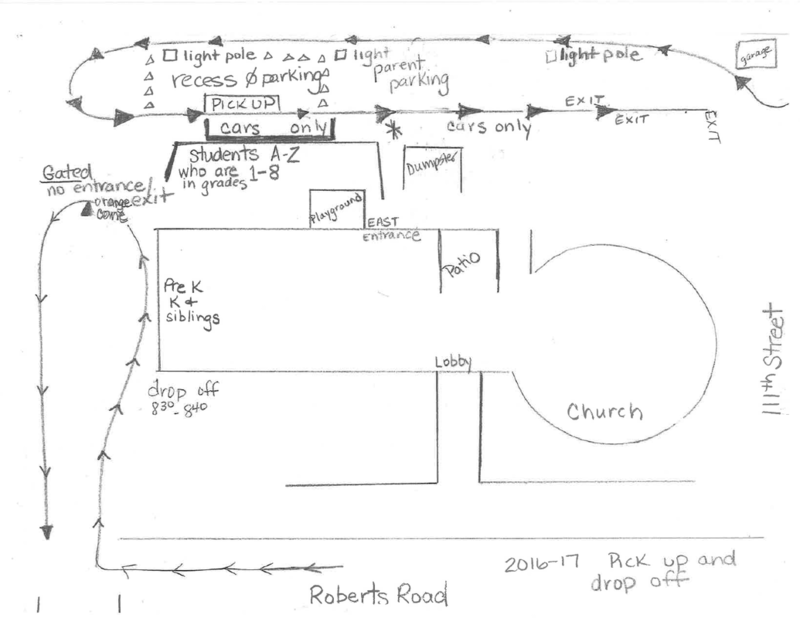 Student drop off is at the church lobby entrance. Students will go to the East Room and wait there until prayer service begins promptly at 8:45. Parents are to park in the east parking lot and ring the buzzer at the east entrance. Parents go to the school office and inform Mrs. Christine who is being picked up. The office will buzz the classroom and the child(ren) will meet the parent by the office. Any students remaining outside at 3:25 will be brought to homework club.